Ketchikan, Alaska - Sitka spruce in some areas of Southeast Alaska may be facing a tough year because of spruce aphids, according to U.S. Forest Service Alaska Region Entomologist Mark Schultz. According to Schultz, the spruce aphid has been on the rise throughout the past month in many locations, but especially in Craig, Sitka and possibly Ketchikan. Spruce aphids are an invasive insect which kill Sitka spruce by sucking the sap from the needles. A large number of trees have been defoliated in Craig, Juneau, Ketchikan, and Sitka. Spruce aphids will not usually kill a tree in one year, and several years of defoliation are needed to kill a big tree, defined as a tree that is bigger than 24 inches diameter at breast height. Before treating a tree, determine if the pests are present. Look for trees that are thin or lack foliage, said Schultz. 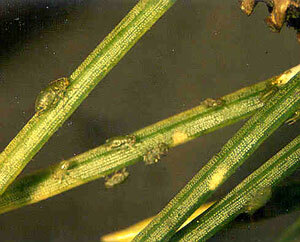 The best time to treat trees for spruce aphids is by mid-June. After that, most of the damage has been done until fall. Schultz recommends treating with ace caps, which he says are available at hardware stores or through online shopping. Research is under way to determine improved treatment methods. 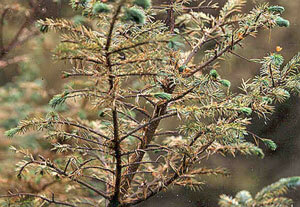 There should be fewer problems with spruce aphids in Juneau this year. Only a few trees have been seriously affected there because significant cold temperature periods occurred earlier this year.